Anna Cambiaghi is a multi-talented Italian lady who took part in rallies and sports and touring car races, and was most active in the late 1970s and early 1980s. She was born in 1951. She seems to have begun her motorsport career in rallying, in 1973. Her first rally car was a Fiat 124 Spider, which she used to the best effect in the Lugnano event, finishing second. She campaigned the Spider and an Alfa Romeo in the Italian Championship in 1974. That year, she also finished the Tour de France in an Alfa Romeo 2000 GTV. Her first major events seem to have been in 1975. 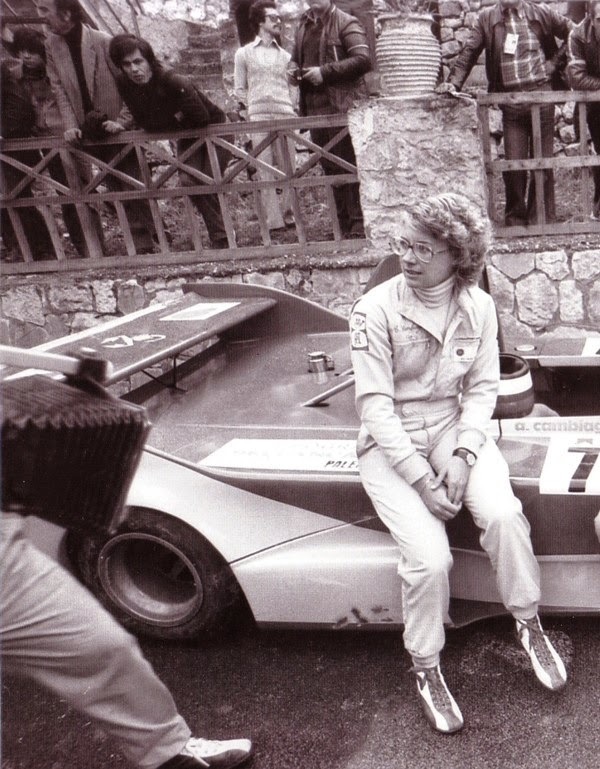 That year, she was ninth in the Targa Florio, driving an Alfetta with Serena Pittoni. They won their class. She also drove the car in the Italian Rally Championship, and won the Ladies' title for the second time. In rallying, she made four WRC starts between 1977 and 1979. Her only finish was a 56th in Monte Carlo in 1979, in a Citroen CX 2400. Her only start in 1977 was the Tour de Corse, in a Toyota Celica. She was part of the all-female Team Aseptogyl in 1978, and entered the Sanremo and Corsica rallies, in a Lancia Stratos and Fiat 127 respectively. Her Citroen drive in 1979 was also through the Aseptogyl set-up. Her three non-finishes were all due to mechanical failures. Before her rally exploits, Anna tried her hand at more big sportscar races. In 1976, she was part of a Jolly Club effort in the Imola 500km, driving an Osella PA2 Abarth with Giorgio Pianta. She drove for Jolly Club several more times that season. After travelling to Germany for the Nürburgring Six Hours, Anna, Gaudenzio Uboldi and Luigi Colzani were eleventh in an Alfa Romeo GT. At Salzburg, Anna was scheduled to drive the Osella, but did not. At Monza, she took part in a European GT race, and was seventh, winning the GT1600 class. Her car was an Alfa Romeo 1600 GTA and her team-mate was Giancarlo Galimberti. This was a private entry, rather than a Jolly Club one. Another private Osella drive, in a Group 6 race at Varano, netted her another seventh place. As well as this, she was runner-up in the Italian GT Championship in the Alfa, and Italian Ladies' racing champion. In 1977, she continued to race sportscars and briefly switched to a Lancia Stratos run by Jolly Club. In the World Championship for Makes, she was eighth at Mugello. For the rest of the year, she drove a series of Osella models and was ninth in the Vallelunga 400km in a PA2. She drove the same car in the Targa Florio, Imola 250km and the Monza 500km, but only finished the Targa Florio. 1977 also featured her first Le Mans entry. She retired in a factory-supported Osella PA5, after two other drives fell through: one in a Jolly Club Stratos and one partnering Giorgio Francia in another Osella. Raymond Touroul and Alain Cudini were her co-drivers. The following year, she was a reserve entry, having failed to qualify in a Lola T96/7 with Pascale Geurie and Martine Renier. During 1978, she continued in international sportscars, but not with any success. A drive in Carlo Rebai's Porsche 935 at the Mugello 6 Hours led to a DNF, and she did not even get to start in Ruggero Parpinelli's Osella PA5 at the Nurburgring 300km. 1979 was a quieter year on the sportscar front, with just a run in the Giro d'Italia in a Fiat Ritmo. This season, she did some more rallies, including her last WRC entry and the Rally of Brazil. In this event, she was fourth, driving a Fiat 147. She used the same Ritmo model in European Touring Car races in 1980. Along with "Gilena" and Santucci, she was seventh in the Monza 4 Hours. With Santucci, she entered the Vallelunga 500km but did not finish. Along with Marianne Hoepfner and Lella Lombardi, she drove an Opel Commodore in the Mugello 24 Hours, but did not finish. In 1980, she also tried her hand at Formula Three in Italy, without great success. She entered three races in a Ralt RT1 but did not score points. Unbelievably, she still found time to win the HGV class of the Transafrica rally raid too, driving a 19-tonne Iveco. Briefly, she returned to Formula 3 in 1981. This was a one-off entry in the Ralt, and again, she did not score any points. In 1981, Anna was reunited with the Jolly Club team, and forged what was probably the most successful partnership of her career. Driving the Jolly Club Chevrolet Camaro in European touring car enduros, she got together again with ex-Formula One driver Lella Lombardi. Both drivers had been active in Osella sportscars in previous seasons, but had only competed together once before, despite often driving for the same teams. Their first race together was the Monza 4 Hours, and they did not finish, but they made up for it in the next race, the Vallelunga 500km, by finishing fifth, with a class win. At the Donington 500km, they were third, and aat Salzburg, they started from pole, but could not finish. It was the same story at Brno, although they were using the sister car of Luigi Racing that time. A third grid position led to the same engine-related retirement, and sadly, so did Anna and Jean Xhenceval's pole at Zolder. The Camaro was replaced with an Alfa Romeo Alfetta GTV6 in 1982, which proved more reliable. Anna and Lella were fifth at Monza, ninth at Vallelunga, fourth at Donington, seventh at Pergusa, and did not finish again at Brno. They scored class wins at Pergusa and Donington and their performances were enough to give them the Group Two class of the ETCC. After two seasons in the ETCC, Anna took a break from competition. On her return in 1985, she joined back up with Jolly Club and went back to the ETCC in an Alfetta GTV6. She was ninth at Zeltweg with Marcello Cipriani and Massimo Siena, but could only manage 18th with Dagmar Suster in the EG Trophy. In 1986, she stayed in the ETCC but jumped ship to CiBiEmme and drove their BMW 635i. Her team-mate was Georges Bosshard. They were 15th at Donington, eighth at Hockenheim, thirteenth at Anderstorp and eighth at Brno. After 1986, she returned to rallying, especially rally raids. Having driven a few events in a Peugeot in 1986, Anna competed as both driver and navigator in Italy in a 205 and a 309. Later in the year, she drove a Suzuki prototype in the Pharaohs Rally, with Daniela Angei. The following year, the same pairing completed a rally raid on Sardinia in the same vehicle, but changed to a Samurai prototype for the Pharaohs Rally. They won the up to 1500cc prototype class. Anna's last year of competition was 1989. Her last event was the Safari Rally, in a four-wheel-drive Mazda. She does not appear to have finished. More recently, she has been working in motorsport organisation, acting as "sportive lead" for the Honda IRC team.